“It’s sort of a combo of the old one and the new one, so it’s… I don’t want my marketing guy to be pissed at me for giving away too much, but it goes back underground and it’s really cool,” Bilson continues. No word on if the company has recently changed marketing guys, as earlier this month he did elaborate a bit more about the changes that are in store. Among the issues present in Guerrilla, he adds, were the “simple things” that were really the major problems. “…being in a dusty environment for a long period of time could get a little monotonous,” for example. 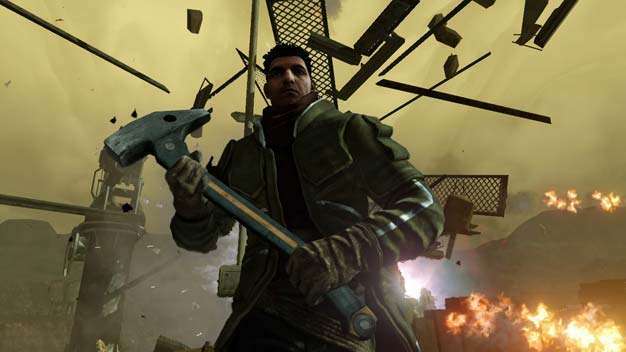 “I think the story [in Red Faction 4] is way more intense this time and I think the story was way secondary to the gameplay last time. It’s more integrated this time and it’s a cooler story, it’s cooler environments and there are elements in it that have never been in a Red Faction before as far as enemies go and… ahh (laughs),” finishes Bilson.